Concord Homes has been proudly serving Kingston and the surrounding area ever since 1999 with customized construction services. Our goal is to help you build a home that perfectly matches up to your creative vision. Maybe you want to construct an addition or a basic home shell, or perhaps you have something a little more creative in mind; whatever your requirements, our talented team will bring your vision to life. 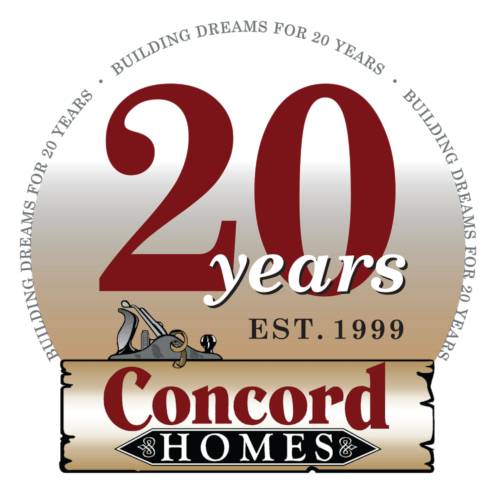 We built Concord Homes upon a solid foundation of quality, integrity, and commitment. Are you ready to see your home transform before your very eyes? Give us a call and we can get started on the consultation process. Building a home is a huge deal, and Concord Homes understands that. We use efficient and sustainable building practices and only use the highest-quality of materials. Our craftmanship and unparalled attention to detail will ensure that you get that home you’ve always wanted. Give us a call today to learn more about our services! At Concord Homes, it is more than just building a house to us. Over the years, we have built long-term relationships with all of our clients. We want you to be living in the home of your dreams. Have a specific design request for your future home? We can build it! We only build homes constructed to last the tests of time. Call us today! Concord Homes is committed to creating that perfect home for all our clients. The home building process can seem like a handful sometimes, but don’t stress! We have a guaranteed site foreman on every project that is there for you, every step of the way. We strive to make this process to be as easy as possible for you. Reach out to learn more! Here at Concord Homes, we understand that building your dream home is a collaborative effort. Before we begin any work, we will go through extensive efforts to ensure we totally understand your perspective on the project. We have over 19 years of experience making dreams come true; our expert team has been designing and building custom homes since 1999. Take a look at some testimonials from some of our satisfied clients. Please be sure to pass on our extreme pleasure and delight with our home. It is coming along so beautifully. Yesterday when I walked in to see my cabinet exactly where I wanted with the bonus of having a plug placed where I wanted it made me extremely happy. It's those little things that Martin's team does, to go the extra mile that make such a difference. I know that the finishing work and all the details involved takes an immense amount of time, but it is so well worth it. (They could have easily covered the plug and not given me a new one and there are so many extras that I can't even mention them all.) Hank has been great that way and Randy with the siding, as well has John doing his magic with the electrical. We love the way the painting has turned out too, how the round edges are absolutely painted perfectly when the colors have changed. Gordon's floor and ceramic work is outstanding. The way Gordon made the tile direction move with the corner shower benches makes a wonderful effect - plus doing the ceiling in the shower - wow - that blew us away. We cannot believe how gorgeous the finished product is and what a delight it's been working with everyone. It's been a most pleasurable and enjoyable experience. I just wanted to let you know. From your satisfied customers. We did not want any more time to pass before saying a great big thanks to everyone who helped build our second Concord home. After almost 6 years in our first one, we knew that we would not be satisfied with anything less. The whole Concord team displayed a respectful attitude and was always willing to accommodate our wishes. The crew’s dedication to the job was truly fantastic and attention to detail is second to none! We are very pleased with our new home, and will certainly recommend Concord Homes to anyone who wants to have a pleasant building experience. As the last tweaking is in process on the building of our house, we are taking this opportunity to express our gratitude and our total satisfaction with the work that you undertook more than 6 months ago and are now completing. We commend you for your patience and your guidance during the planning process, your flexibility and diligence during the building and most of all your leadership in putting together such a great team to do the job. We love our new home; your team has done a superb job. The quality of work is outstanding, the craftsmanship is remarkable and the end result is beyond our expectations. Each and every person involved was dedicated and professional. Throughout the construction we appreciated their skills, enthusiasm and the pride that they have shown in their work. D. P. & M. L.
I tell you it was a real pleasure to connect with someone so efficient, so quick and so very pleasant all the times we had to "discuss" or make decisions about things. I still think it would be very nice if we could meet some time. I will see the 'cottage' only in September some time because I can't stand the heat or the crowds. The cottage has been filled to capacity ever since it opened on July 1st and word has it that all the nuns think they've died and gone to heaven - prematurely! They love it and say it is the most beautiful place we own in all of Canada! Isn't that nice? Martin's name is sacred to all of us! So, that's my happy message for today. Once again, thanks for the part you played in making us all so content. Do have a great summer and take good care of yourself. From start to finish, building our new home was an enjoyable experience, thanks to Martin Mack of Concord Homes. Martin's commitment to customer service with his personal touch helped us fine-tune our vision. Martin was willing to accommodate changes, and he maintained superb quality and attention to detail every step of the way. We were impressed with Martin’s unwavering integrity and his good-natured disposition throughout the process. We have never regretted our decision to choose Concord Homes as our builder. We highly recommend Concord Homes to anyone who wants to have a positive building experience. We have meant to write this note for a long time, but I guess it's better late than never! My wife and I want to say thank you for a great job on our new house. The end product is fabulous - we continue to get gushing comments from everyone who visits. But even more important was the process. When we started the building, we always had in the back of our minds horror stories about contractors who didn't finish things, or did shoddy work, or were just nasty to get along with. We were more than pleasantly surprised with the whole experience - you and your team could not have been more accommodating, more professional, or more pleasant. By the end of the process, we felt we had developed a group of friends rather than just a business relationship. Overall, we were pleased with all your staff and subcontractors, but we want to say a particular thank you to Hank, who was key in supervising, and in doing a lot of the detail work that was so important to the final product. You have some interesting people working for you, and they'll make for great characters in the book I plan to write some day! We chose Concord Homes in 2006 to add a substantial -- and sympathetic -- addition to our late 1800's clapboard house, and the result was featured in Chatelaine magazine. This is a tribute to the care and effort Concord took with the project. The team we worked with was conscientious, hard-working, respectful, highly professional, and incredibly skilled. The foreman gave our ideas and wishes credibility and factored them into the structure; he kept everyone firmly focussed on their tasks; made sure every detail was properly looked after; ensured the work site was perpetually clean, safe, and tidy. Martin, the company head, was always available to us and Janice, the chief administrator, made sure communications were kept running smoothly on all sides. They were flexible when flexibility was called for, and we felt at all times that we were getting our money's worth. And more. We cannot say enough about the company and continue to recommend Concord to all our friends planning to build. It is an impressive company. Not only can Concord Homes help you achieve the home of your dreams, but we can also help you do your part to help the environment. In addition to being environmentally conscious, we can also help you make incredible savings on your energy bills. With our help, you could save up to 70% on heating and cooling costs! We can also assist you in outfitting your new home with the most-energy-efficient appliances on the market, helping you save even more money. Thanks to our money-saving measures, your project just might be more affordable than you think. Are you looking for a custom homes and renovations contractor who can help you build the home of your dreams? Concord Homes is an industry leader and our quality has been recognized in various organizations such as Canadian Contractor magazine, the Kingston Parade of Homes, and the Canadian Home Builders Association. You can count on us to treat your project with care and attention from the beginning to the end. If you are ready to make your dreams into a reality, get in contact with us today. Let’s start on the home of your dreams today! Reach us by phone or email, or fill out the contact form on this page for more information.